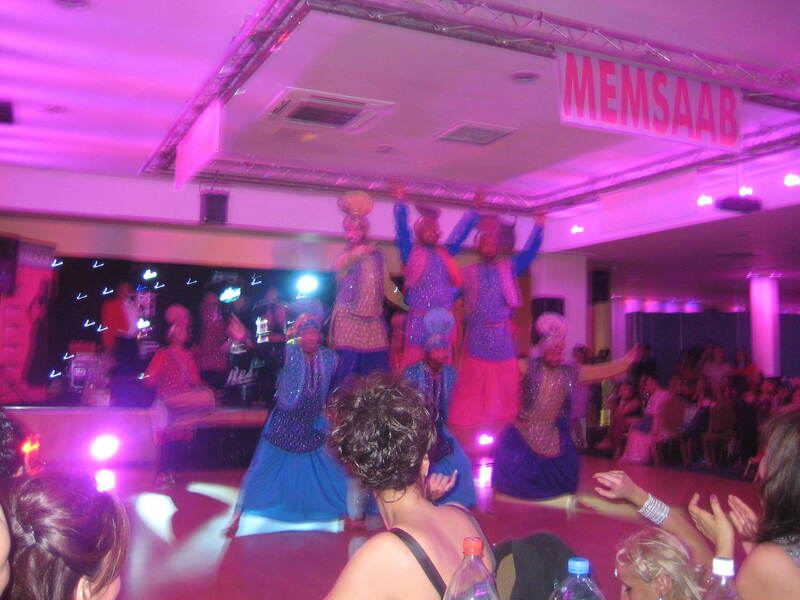 Ladies night functions held in Birmingham that proved to be great nights out. December 3rd was the date and at 5:00pm it was suit up time with hair straighteners and make up. I was preparing to go to an Indian Ladies Night event held at Second City Suite in Digbeth - it is strictly for women only. The majority of young girls nowadays might just sigh and think that the scene at an event like this isn't ideal, purely because there are no men or boys around. Admittedly this is what I thought the first time I went to one, but my attitude towards it completely changed the minute I walked into the venue and now, I've been to six of these events. When walking into Second City Suite on the Friday night, you step into a room filled with colourful lights and women everywhere, dressed head to toe in silver and gold in saris and lenghas and sparkly dresses. Everyone dressed as though they are going to a wedding. Thus, one of the first good points about these events, a chance for girls to go all out and really dress up and make the effort which seemingly is something not everyone gets to do every day. Ladies are treated to a three course meal with a variety of vegetarian and meat dishes, and all of the meat was available in both halal and non-halal varieties, as well as a dessert, which could be anything from fruit dishes to Indian sweet dishes all served with ice cream. The fun didn't stop there, I remember everything from the first time I went to this event, when the upcoming Punjabi singer Jaz Dhami walked on stage at 11pm and performed for the final hour. The excitement was unreal as he sang to hundreds of screaming girls all crowded around a tiny stage. It's fair to say that it felt quite unreal as he knelt down and sang one of his love songs to me and a screaming teenager who looked like she was about to faint. Jaz has performed at two of these events and put on amazing performances of his best tracks on both occasions. He even treated the screaming ladies to a little Bhangra ensemble as he sang his biggest hit "Theke Wali". Later he gave autographs and posed for pictures. Admittedly, I didn't know that much about him at the time, but soon after that night, BBC Asian network and Brit Asia were playing his tracks and now he's become a hugely successful and popular star. Another amazing performer had to be H-Dhami, who still managed to turn up to the December event despite the fact that Birmingham was suffering a dangerous week of snowfall. H sang and danced to some of his biggest songs, being courageous enough to jump off stage and run into the middle of the crowd to dance with the ladies who hadn't managed to touch him already. He then did a fantastic and exciting duet with Mumzy Stranger afterwards, something you wouldn't get to see live every day. Every single performer that has been to the events agreed to meet and greet all of the ladies in the venue, luckily for me I have pictures with H dhami, Garry Sandhu, Mumzy stranger and Jaz Dhami. After going to quite a few of these events, I started to realise that these are the kind of nights that suit women who live restricted lives. You go there and there's loads of women who wear head-scarves, religious women who you know would socially distance themselves from men. Events like this make it possible for women like this to go out for one evening and enjoy themselves, dressed however they like without worry of there being any male company surrounding them to give them discomfort. I can remember the times on the dance floor and I'd look around and see women of a seemingly religious nature doing Bhangra, spinning around and jumping about with other people, you could actually see how much fun they were having. It might just seem like a night out for women, but from looking at these individuals, it really made me see how this is totally ideal for them. Although the night is Indian themed, it wasn't just Indian and Pakistani women that attended. I remember from one night there was a group of African women who were stood behind me singing and dancing and looking like they were really enjoying themselves. I've even taken a few of my English friends along who weren't afraid to dress up in Indian wear for the night. People from various different cultures from Chinese to African to English attend these events and look like they have the time of their lives even though they may never have heard of Garry Sandhu of Jaz Dhami or the Bhangraheads. You could dance with any happy lady on that dance floor and not care about the fact that you don't know who they are. I guess the point I'm trying to make here is that ladies night is so much better than people think. There's so much going on, you can see top performers, meet new people and be in an environment that doesn't make you uncomfortable. It's a chance for ladies with restricted lives to go out and have fun for a night without the need to really behave themselves in front of others. It's the chance for girls to dress up, get together and go for a night out to these fantastic venues and have a great laugh. I really enjoyed it, and I think any girl that hasn't been already, should, because you will enjoy it!